After another good night’s sleep all round, my auto alarm woke me up at 7 so that we could be at breakfast by 8 and on the road at nine(ish). 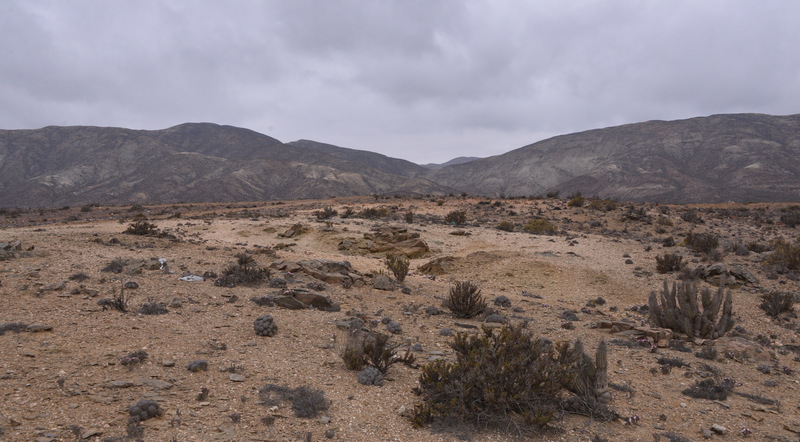 We did not have far to go, just a quick drive to the Eriosyce (Thelocephala) napina location at Huasco, where we would meet Brendan & Lucy Burke (S2891). Just as I was explaining what cacti we would see to JYC, Brendan & Lucy arrived. They had a nice big 4×4 Nissan, one size up from ours, a bit like our Dodge Durango from the first three weeks. 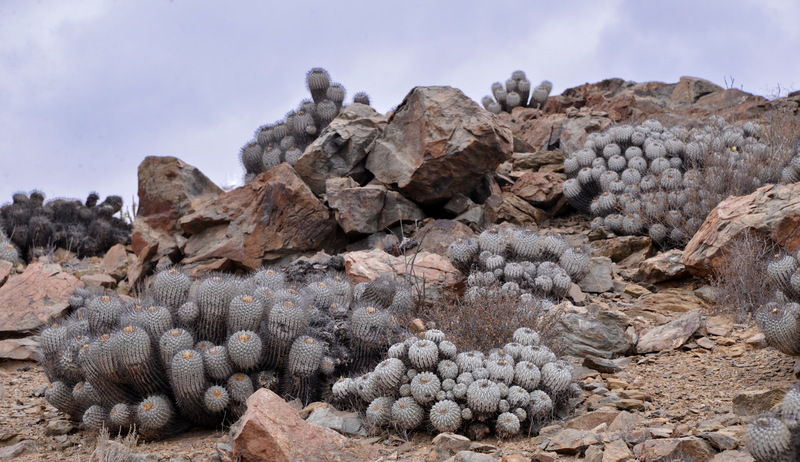 They had never been to this spot before, even though Brendan had been visiting Chile longer than I had, his emphasis had always been on Copiapoa and because they tended to visit in January, when the Thelocephala were mostly asleep, they had never bothered with this stop. 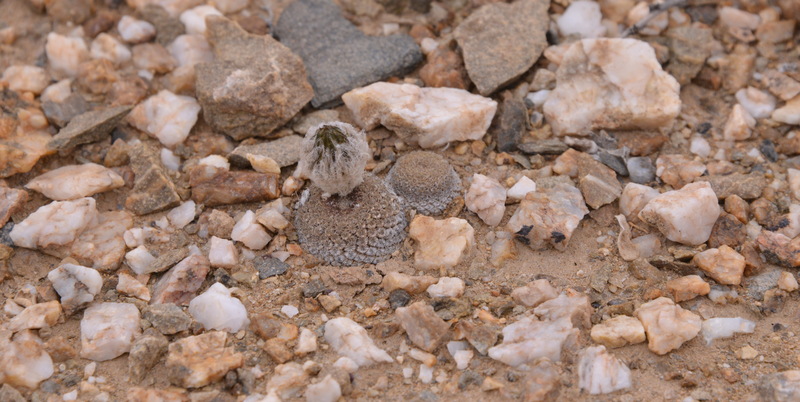 JYC was hugely excited by the clumps of C. fiedleriana, the Eriosyce (Thelocephala) napina and the E. (Neoporteria) villosa, Eulychnia breviflora and Oxalis gigantea, in flower. Brendan & I spent much too much time chatting, catching up on various points but eventually had enough images so we headed for Quebrada Mala, now a convoy of 3 cars – 6 people. After a km or so Brendan flashed me and warned that my rear tyre was low. We had our first puncture – the huge nail was clearly visible. Fortunately a ‘Vulca’ (tyre repair place) was just around the corner and the guy had us quickly back on the road for the princely sum of 3,000 Chilean pesos – about £3. Before making him the man of the moment in resolving this incident, I have to acknowledge contributions by JYC and Brendan in liberating the spare tyre from the luggage compartment and removing the punctured tyre and replacing it with the spare before I drove the car to the Vulca. Back on the road we took the turning in Huasco Bajo for the beach (Playa). We’re all going on a summer holiday…. (Cliff Richard song). 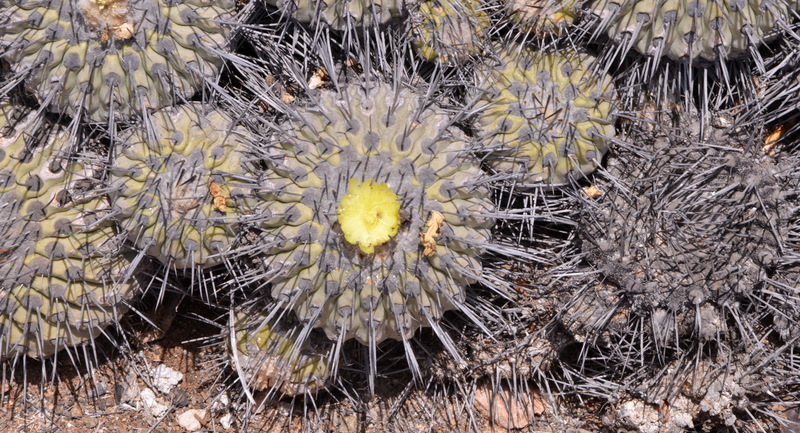 At Quebrada Mala (S2892), JYC was keen to key out the next Copiapoa into his App but came up empty – no wonder, C. echinata was not recognised as a good species in the NCL, so had not been included in the App. 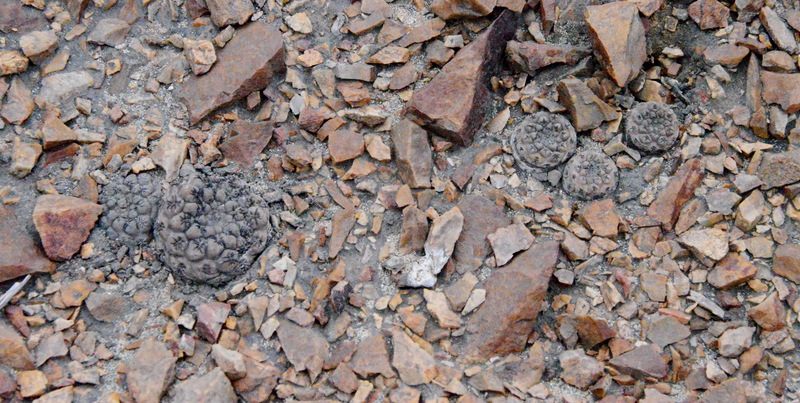 While looking at C. echinata we were distracted by another cactus, although not a Copiapoa: Eriosyce (Thelocephala) odieri. 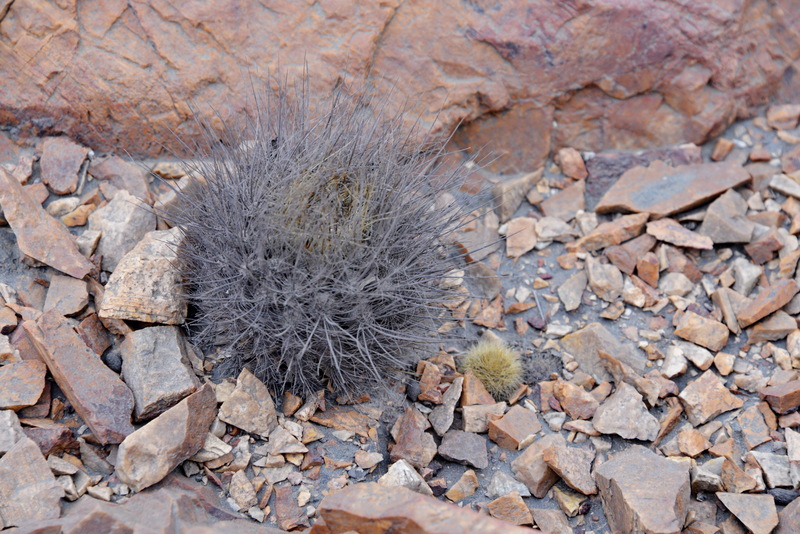 Several small plants were found, together with a few rabbit and guanaco droppings for good measure. 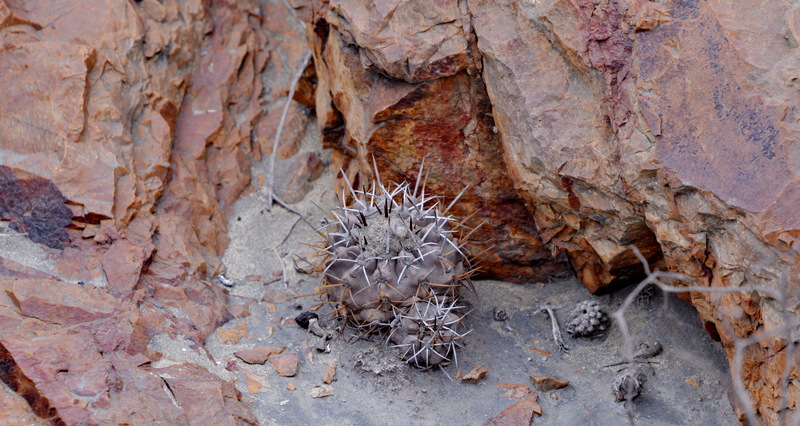 I then pointed JYC to the bottom of an arroyo which had its sides covered with more Copiapoa that easily keyed out to C. dealbata on the App. And so we drove on to Carrizal Bajo (S2893 – no cacti photographed) where I recounted some more cactus folklore about our crossing of the sandbank back to town when the tide was in, in 2001. This time we elected to take the new main road and cross the stream over the new bridge and drove another 12 km for another population of C. dealbata (S2894) that included some very nice crests spotted here earlier with Angie. Before moving on we surprised Brendan & Lucy with the the remains of the peach cake that we had bought yesterday – surely that is how all cactus parties enjoy a snack on their trips? Then it was on to the Llanos de Challe National Park S2895) where we wanted to see Eriosyce napina spp. challensis. At the foot of the hill was another Copiapoa that was new to JYC: C. echinoides – another triumph, as it keyed out OK in his App. Time was ticking on and Lucy & Brendan still had to find beds for the night, so Bart & Marijke decided to spend some time on the beach while Brendan & Lucy chose to follow our car as we went looking for a new road to Maitencillo. First SatNav took us right up to Minas Collorados, as new mine to us, but one that seems to be very busy. It turned out to be a dead end at the mine. We followed the track through to R5 where after about a km. we found another track, signposted to Maitencillo, 12 km away. 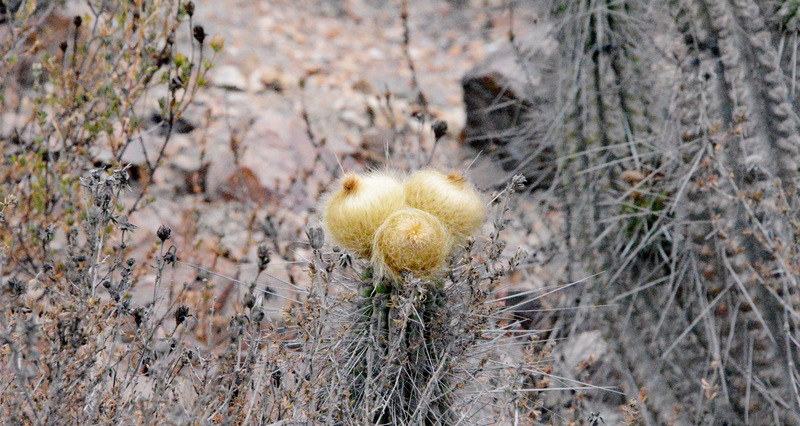 The area was very barren and we did not see any Copiapoa, so nothing too excited. I was remarkably tired when we got back to the hotel. Unfortunately there were no rooms for Brendan & Lucy here tonight but they found another hotel nearer the centre of town.